The Earth Observer newsletter is a bi-monthly publication that consolidates NASA Earth Science news. 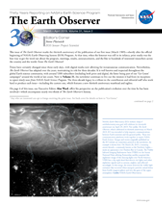 The newsletter is published by the Science Communications Support Office, Code 610, NASA Goddard Space Flight Center, Greenbelt, Maryland 20771, telephone (301) 614-5561, FAX (301) 614-6530. Articles, contributions to the meeting calendar, and suggestions are welcomed. Contributions to the calendars should contain location, person to contact, telephone number, and e-mail address. Newsletter content is due on the weekday closest to the 15th of the month preceding the publication—e.g., December 15 for the January–February issue ; February 15 for March–April, and so on. Black and white hard copies can be obtained by sending a message to Cindy Trapp at Cynthia.trapp-1@nasa.gov. To change your mailing address, please call Cindy Trapp at (301) 614-5559, or send a message to Cynthia.trapp-1@nasa.gov. If you would like to stop receiving a hard copy and/or be notified via email when future issues of The Earth Observer are available for download as a PDF, please send an email with the subject “Go Green” to Cynthia.trapp-1@nasa.gov. Your name and email address will then be added to an electronic distribution list and you will receive a bi-monthly email indicating that the next issue is available for download. If you change your mind, the email notification will provide an option for returning to the printed version.